The Dutch anatomist Eugène Dubois, inspired by Darwin's theory of evolution as it applied to humanity, set out in 1886 for Asia (despite Darwin's theory of African origin) to find a human ancestor. 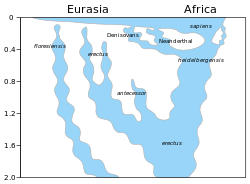 In 1891–92, his team discovered first a tooth, then a skullcap, and finally a femur of a human fossil on the island of Java, Dutch East Indies (now Indonesia). 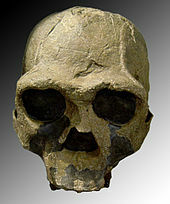 Excavated from the bank of the Solo River at Trinil, in East Java, he first (1893) allocated the material to a genus of fossil chimpanzees as Anthropopithecus erectus, then the following year assigned his species to a new genus as Pithecanthropus erectus (the genus name had been coined by Ernst Haeckel in 1868 for the hypothetical link between humans and fossil Apes)—from the Greek πίθηκος (píthēkos, "ape") and ἄνθρωπος (ánthrōpos, "human")—based on the proposal that the femur suggested that the creature had been bipedal, like Homo sapiens. 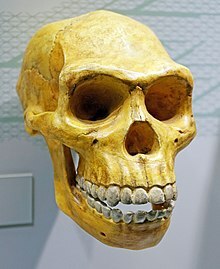 Most of the spectacular discoveries of H. erectus next took place at the Zhoukoudian Project, now known as the Peking Man site, in Zhoukoudian, China. 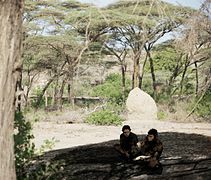 This site was first discovered by Johan Gunnar Andersson in 1921 and was first excavated in 1921, and produced two human teeth. Davidson Black's initial description (1921) of a lower molar as belonging to a previously unknown species (which he named Sinanthropus pekinensis) prompted widely publicized interest. 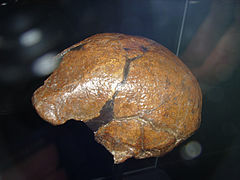 Extensive excavations followed, which altogether uncovered 200 human fossils from more than 40 individuals including five nearly complete skullcaps. 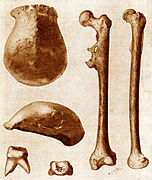 Franz Weidenreich provided much of the detailed description of this material in several monographs published in the journal Palaeontologica Sinica (Series D). 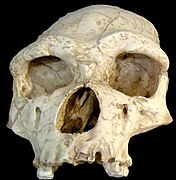 Peking Man (H. e. pekinensis), discovered in 1923–27 at Zhoukoudian (Chou K'ou-tien) near Beijing, China, dates to about 0.75 Mya. 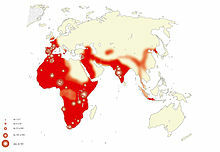 and a new 26Al/10Be dating suggests they are in the range of 680,000–780,000 years old. 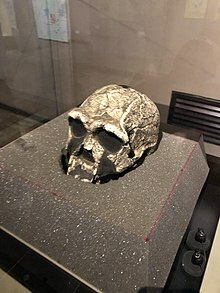 Yuanmou Man (H. e. yuanmouensis), discovered in Yuanmou County in Yunnan, China, in 1965, is likely of similar age as Peking Man (but with dates proposed as early as 1.7 Mya). 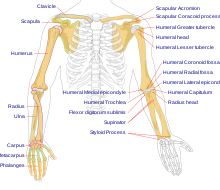 ^ a b Lordkipanidze D, Jashashvili T, Vekua A, Ponce de León MS, Zollikofer CP, Rightmire GP, Pontzer H, Ferring R, Oms O, Tappen M, Bukhsianidze M, Agusti J, Kahlke R, Kiladze G, Martinez-Navarro B, Mouskhelishvili A, Nioradze M, Rook L (2007). 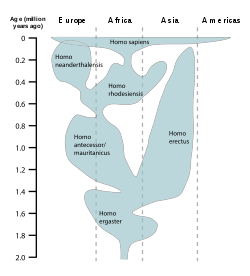 "Postcranial evidence from early Homo from Dmanisi, Georgia" (PDF). Nature. 449 (7160): 305–310. Bibcode:2007Natur.449..305L. doi:10.1038/nature06134. PMID 17882214.